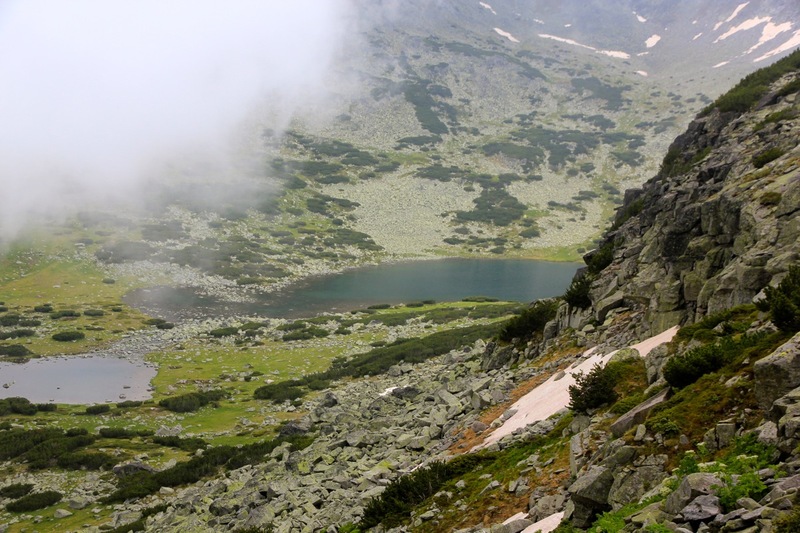 The starting point for this climb is the resort village (mainly for skiing in winter) of Borovets. 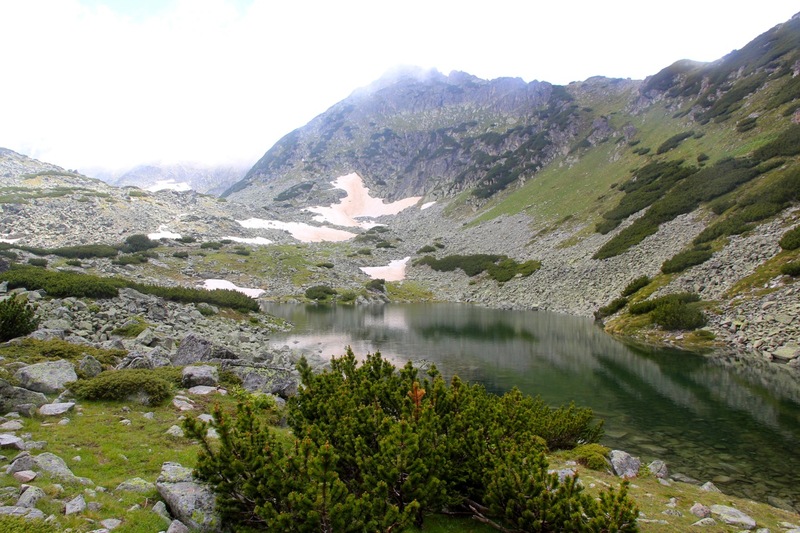 Borovets is about 10 kilometer south of the larger town Samokov. Samokov is served by Hwy. 82 going south from Sofia, or alternatively, going east from the city of Dupnica located along Hwy. 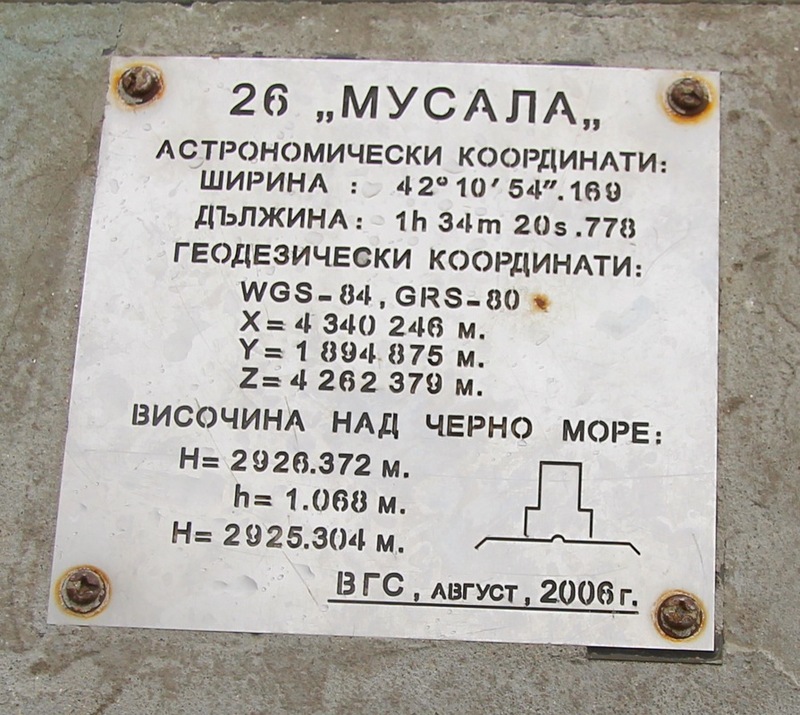 E-79 (also south, but slightly west of Sofia. The gondola starts from the middle of the village, right hand side of the main road, essentially opposite from the largest hotel in town. Note: In order to ensure that you have a minimum of 600 vertical meter ascent (difference between start and summit), consider descending a few meter by going left from the gondola. Such a small detour will only add 10 minutes to the hike. The description by my friend Arnt, with pictures from a sunny day, can be recommended. If I had read it before leaving, much adventure would not have happened (see comments). Head right as you exit from the gondola building, then immediately after you descend a small hill, notice the trail fork just beyond another building (on your right). The route to Musala forks left here, then follows the (service) road as it leaves the ridge. 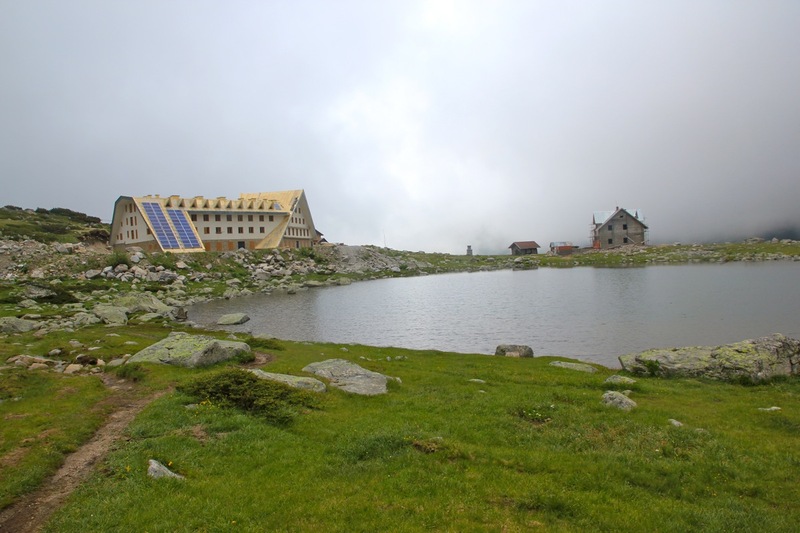 The route will lead into a basin with a lake and several huts, among them what seems to be a large lodge under construction, that is nearing completion (July 2013). Onwards, the trail climbs gently to a higher shelter located just below the final slope to the summit of Musala. From here, the route has a lot of ugly metal poles and cable, completely unneccesary, as it is mainly a burden. The best way to walk involves crossing this cable several times. 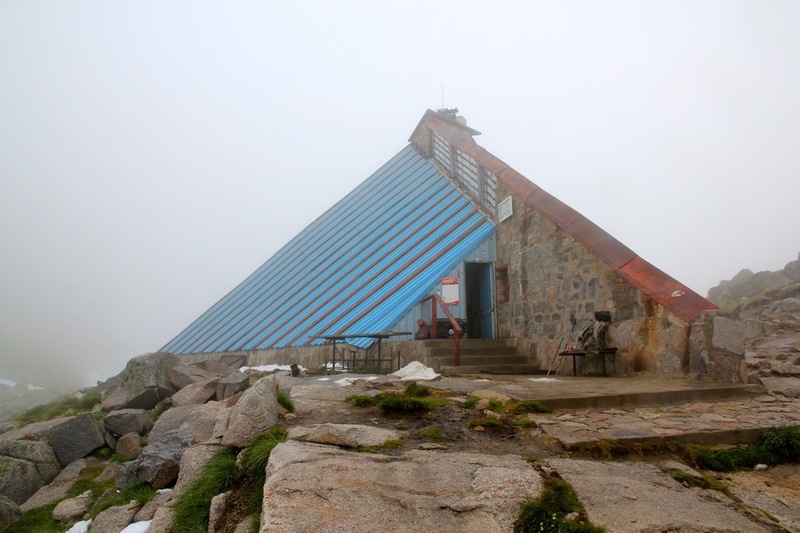 The top of Musala is also, unfortunately, quite ugly with many antennas and a few buildings. There is an official geographic marker on a small, concrete pillar. I started out from Bansko (our "Base Camp" in Bulgaria) shortly after 0700 in the morning. Breakfast opened at 0700 and I dropped by and has a few glasses of juice and some bread. I drove the same way as we had driven from Sofia, but then took Hwy. 82 east just north of Dupnica. Arriving in Borovets around 0900, I wasted some time figuring out where the gondola was located, then where to park my car. I ended up parking in a slot where a clear sign announced that this was metered parking all day. However, as I could not see how to pay, I assumed that the signs only applied in winter time. A round-trip ticket for the gondola was 10 local currency units, about 5 Euro. 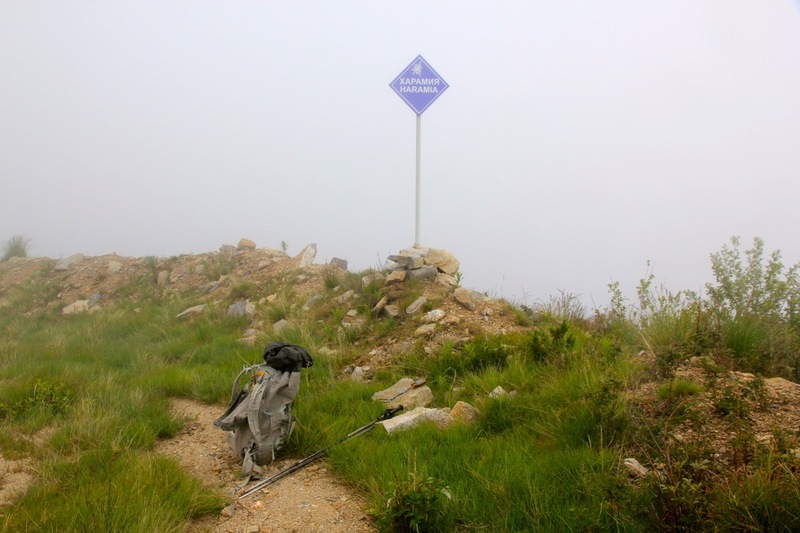 The gondola soon lifted me into dense clouds/fog and upon exiting, the visibility was only a few meter. I hiked 5 minutes downhill in order to drop at least 600 meter below the summit, then started my ascent at 1000 sharp. 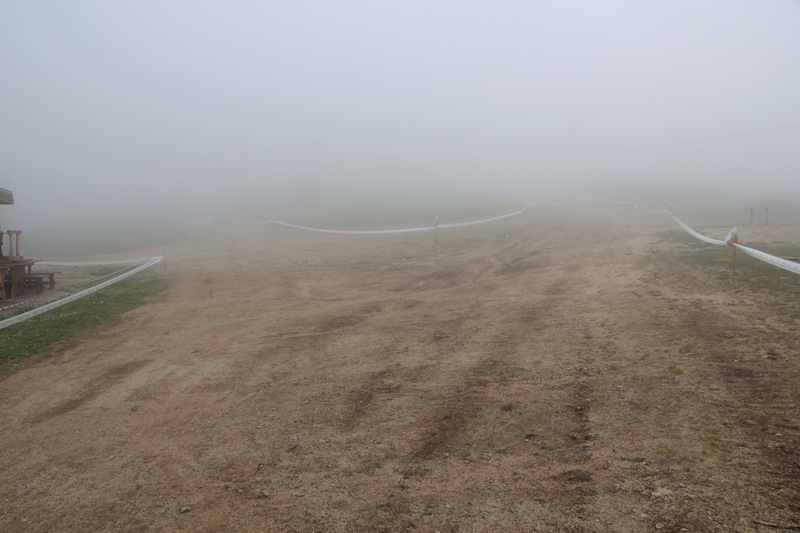 They prepared for a European championship in mountain running and had laid out guiding lines all over the place. Still, with near zero visibility, I do not think I picked the wrong way due to this. 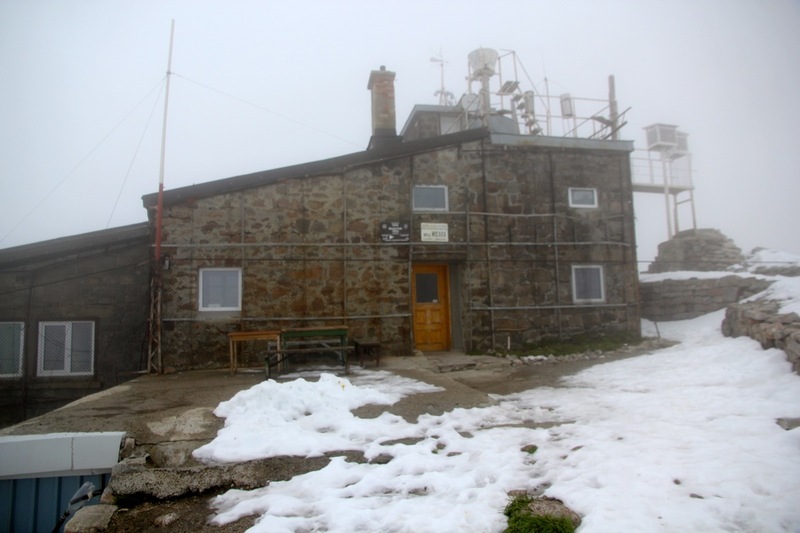 My mind was set on following what I perceived as a broad ridge from the gondola to the summit. Thus, I hardly considered the road that forked left going off the ridge. This being a downhill skiing area, that road looked like a service road serving the skiing slopes. I followed my road along the top of the ridge and passed several top stations for ski lifts coming up from my left hand side. Eventually, the road faded out and I continued on a smaller path. Crossing a first little hilltop, I decided that the main trail most likely ran a bit further left. I walked a bit off the top ridge to the left, but found no trail. Descending more looked very steepish and would certainly take me off the mountain. Everything was clouded in fog. Seeking back uphill got me entangeled into dense vegetation of dwarf pine trees. Very cumbersome indeed. I realized that what had to be a pretty well used trail to Musala somehow had disappeared. The only reasonable option seemed to be to continue along the ridge, my GPS told me that good progress was already achieved. The ridge was broad and easy to walk and it finally was high enough to not having this pine tree trouble anymore. The route, however, looked more complex. Shear cliffs that dropped into the fog on either side. Complex towers on the ridge that needed to be bypassed. I scrambled by a big obstacle to the right, then ascended what looked like a summit. The next passage seemed best on the left, then up a broad, grassy gully. Lots of big, slippery boulders. I realized that my running shoes and my Lewis pants were highly inappropriate. My GPS had told me that this complex looking ridge was more than 1 kilometer. The big concern being that some subsidiary ridge peak up front would cliff me completely out. Well, to worry about such things served no purpose, it was pretty clear that I was committed to reach the Musala summit via this ridge route. To make things slightly less pleasant, the fog was now supplemented by hail from above and new snow on the ground. The cliff was vertical to my left, but now more gentle dropping right. It became more and more evident that this route would go. 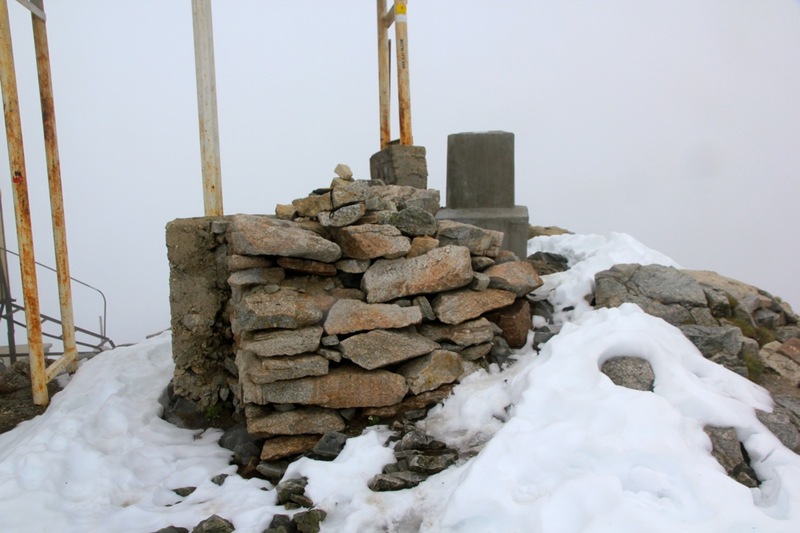 I joined the main trail about 100 meter from the summit and summited at 1300 sharp. What had seemed a very long time was actually only 3 hours. The summit was ugly and heavily poluted by all sorts of metal junk. I walked around to make certain that there was no other higher point hidden in the fog. After 15 minutes, I descended to the shelter, bought myself a coke and rested another 15 minutes. The hike back was exactly as easy as I had imagined. The fog lifted for a few minutes and I could see the ridge that I traversed high up. This basin is likely quite nice with some visibility. 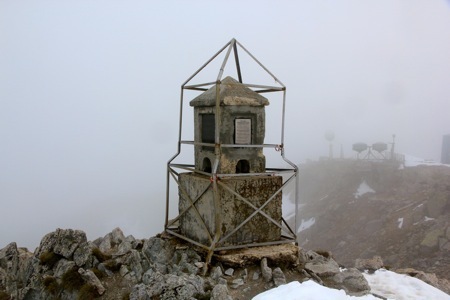 I returned to the gondola by 1515, so a gentle hiking time from the summit and back was 1:45. Here is a map showing waypoints along the route I did.